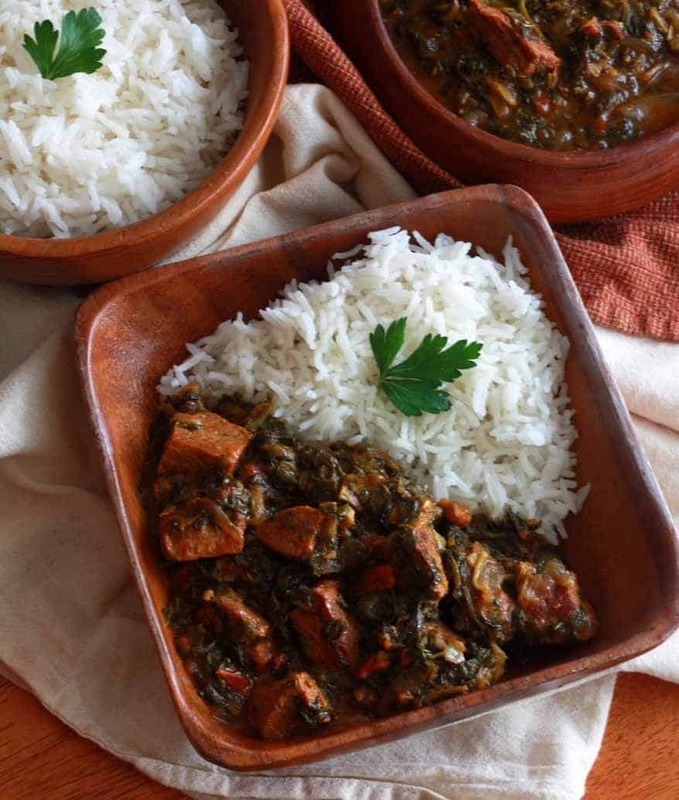 This delicious curry from the northwest region of India can be made with beef or lamb. The rich, complex flavor profile of this Saag Gosht portrays the very best of Indian cuisine. You’re going to love it! 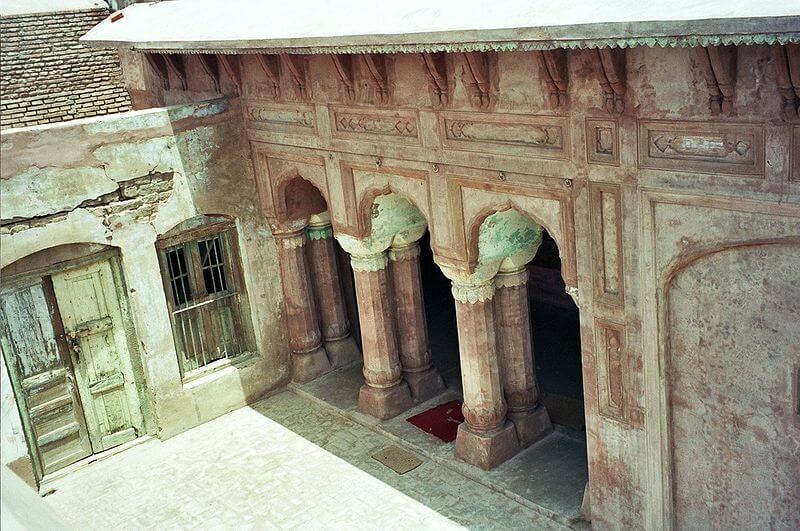 Punjab, a combination of two Persian words, means “land of the five rivers.” In 1947, with the dissolution of British India, the region was divided between Pakistan and India. Punjabi cuisine is known for its diversity, including both vegetarian and non-vegetarian dishes. 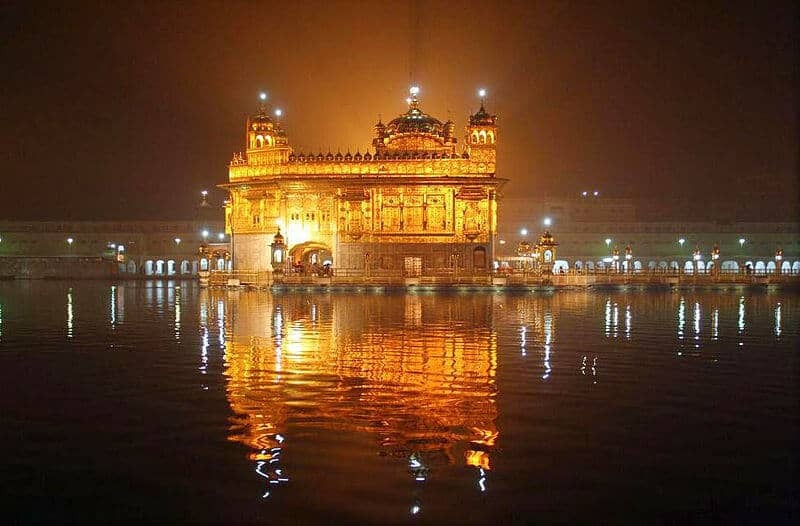 Some popular examples of food derived from Punjab are tandoori dishes, pakoras, naan bread, and vegetable dishes with paneer (a soft Indian cheese). 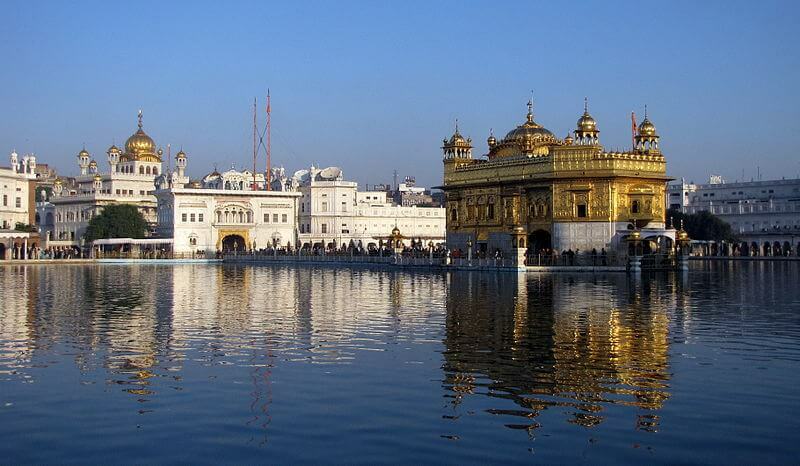 Other Punjabi favorites include Butter Chicken and Chicken Tikka. 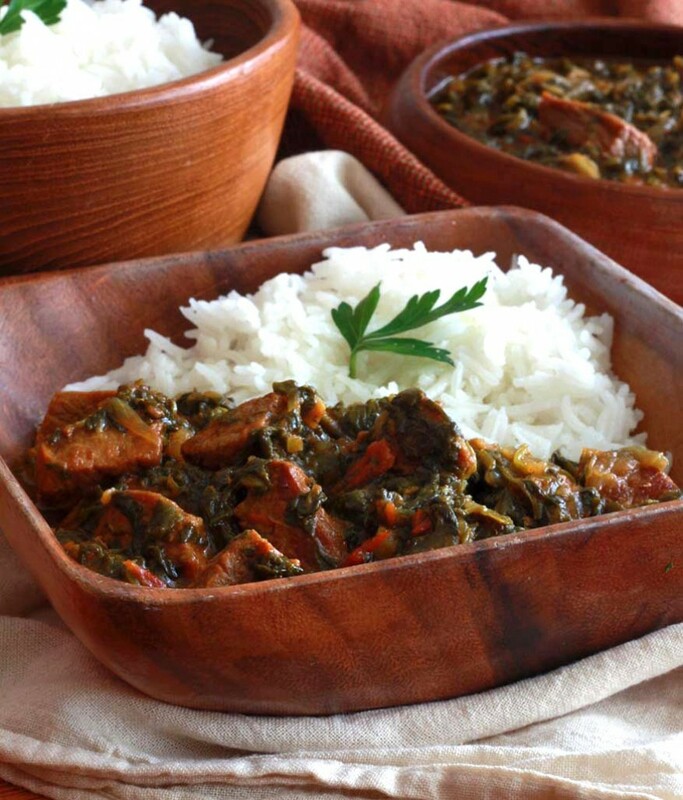 Today’s dish, Saag Gosht, which can be made with either beef or lamb, is another Punjabi favorite. Heat the oil and ghee (or butter) in a Dutch oven (I use and love Lodge) or pot and brown the beef on all sides. Transfer the beef to a plate and set aside. 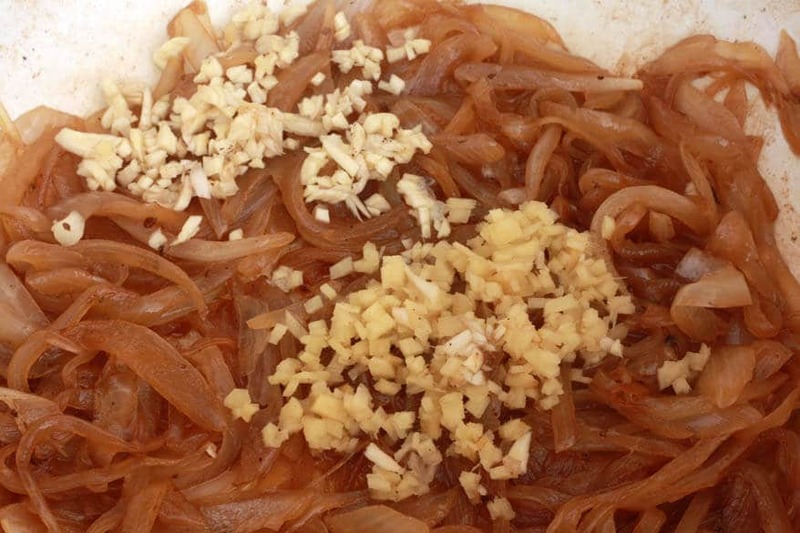 Cook the onions until caramelized, about 25 minutes. Add all the spices, except for the bay leaf and cardamom pods, and cook for another minute. Add the tomato paste and tomatoes and deglaze the bottom of the pan, scraping up any browned bits. Cook for 5 minutes. 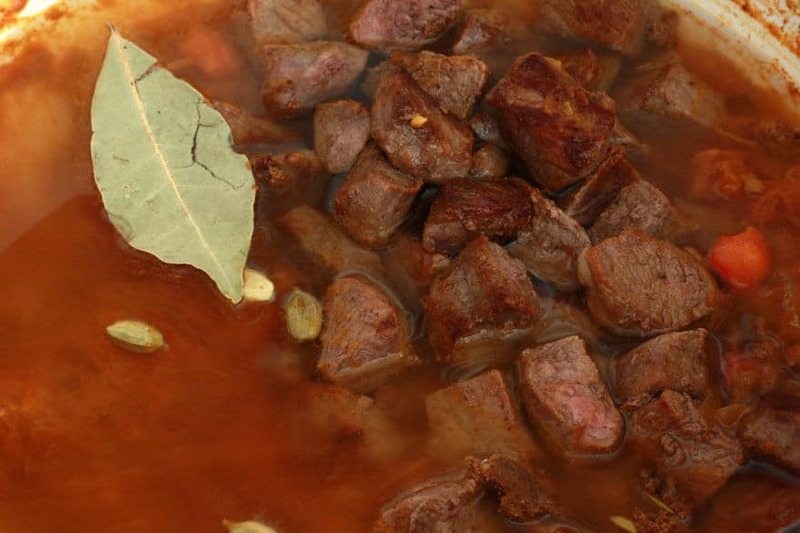 Return the beef and add the bay leaf and cardamom pods. Pour in the beef stock and add the salt. Bring the mixture to a boil, reduce the heat to low, cover, and simmer for 1 hour. Add the spinach and simmer for another 30 minutes. 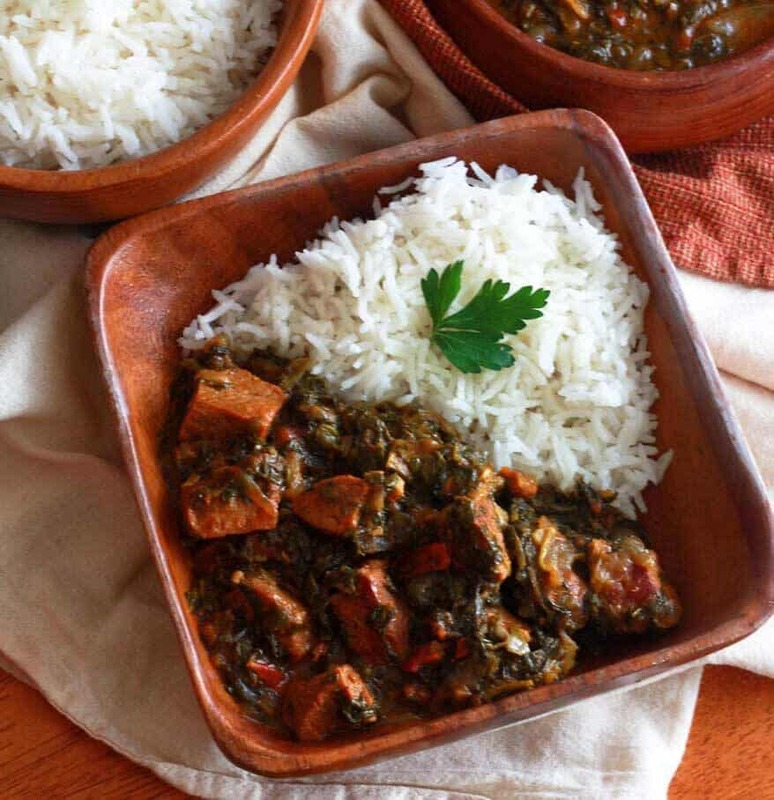 Serve with steamed Basmati rice and/or Naan Bread (see recipe here). Indian food lovers, don’t forget to check out this recipe for the BEST homemade Indian Mango Chutney! Heat the oil and butter in a Dutch oven or heavy pot. 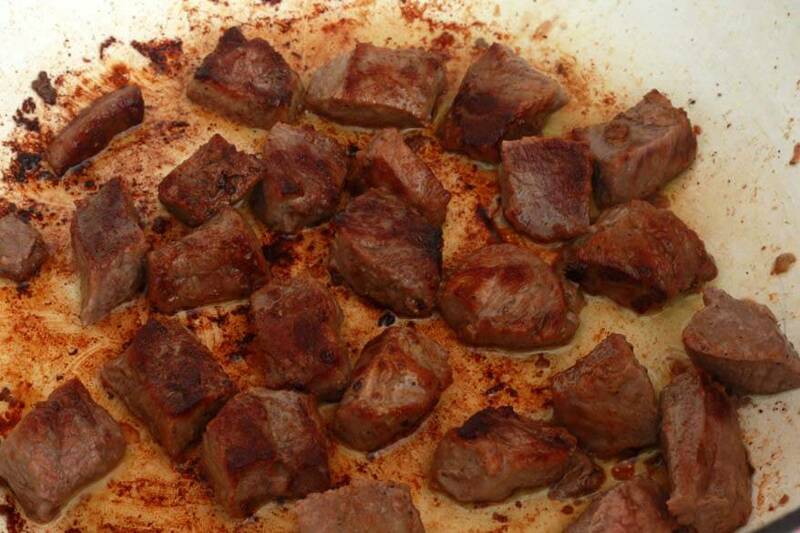 Fry the beef until nicely browned on all sides. Transfer to a plate and set aside. Saute the onions for 25 minutes until caramelized. Add the garlic and ginger and saute for 3 minutes. Add the spices, except for the bay leaf and cardamom pods, and saute for another minutes. 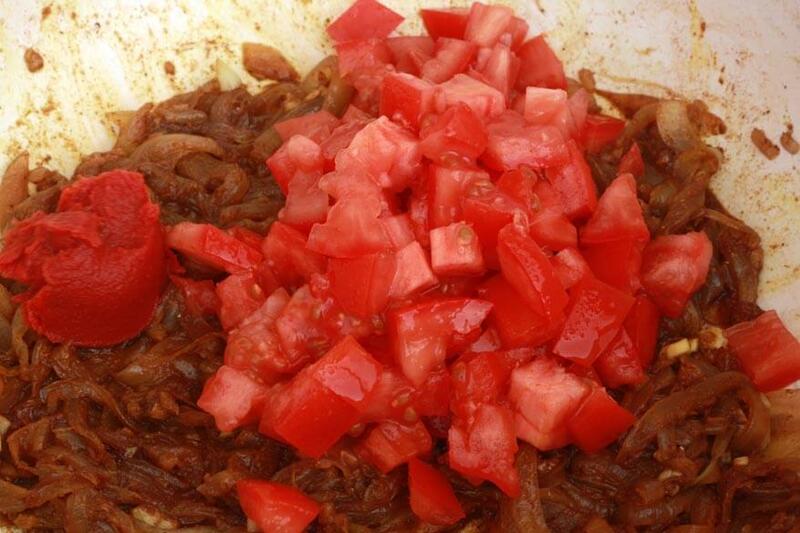 Add the tomato paste and the tomatoes and deglaze the bottom of the pan, scraping up any of the browned bits. Cook for 5 minutes. Stir in the yogurt. Add the beef cubes, beef broth, bay leaf, cardamom pods and salt. Bring to a simmer, reduce the heat to low, cover and cook for 1 hour, stirring occasionally. 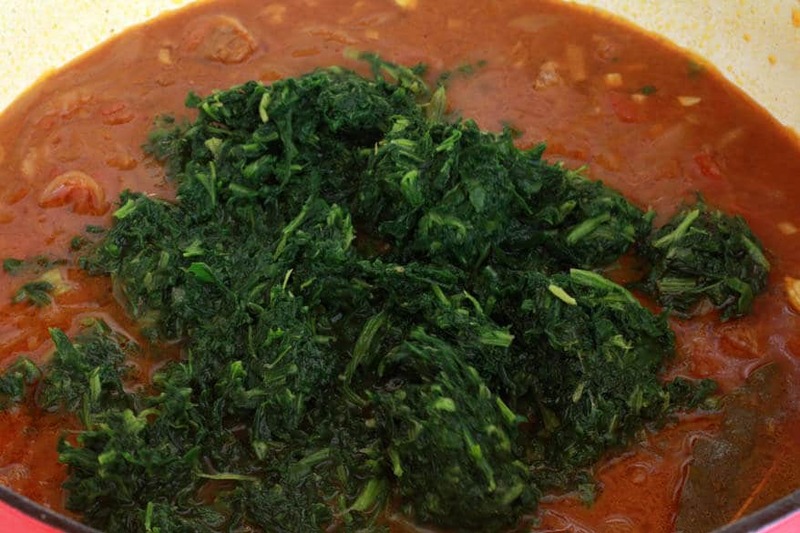 Add the spinach and cook for another 30 minutes, stirring occasionally. Add salt to taste. Serve with steamed Basmati rice. This sounds absolutely wonderful. Given that most Indian restaurants in our country serve a one size fits all version of Indian cuisine, I appreciate that you are posting something that can be traced to a specific state in India, which means we’ll be preparing real Indian food when we make this recipe. The cuisine of India varies so greatly between the different states, just as it does in Mexico, which also suffers from the one size fits all syndrome in the US, that restaurants just don’t do either Indian or Mexican cuisine justice. Thank you for working to remedy that. Recipes like this one (even though I haven’t tried it yet, I’m sure of this) should help people to appreciate real Indian cuisine. Thank you, Susan. You’re absolutely right on both counts. The Indian food served in most restaurants here, while generally authentic, tends to stay within very limited parameters. And Mexican food here tends to suffer on two counts – not only is the selection very limited in regional scope, but it also tends to be more “Americanized” versions of the real thing. And not that any of that is “bad” (I enjoy eating them all) – but like you said, it just doesn’t do either cuisine justice and results in a generally ignorant perception of what Mexican and Indian cuisine has to offer. And as you know, I like to be adventurous and explore new flavors and flavor combinations. I’m glad you appreciate dishes like these. It’s always so interesting to read up posts by you on Indian/Pakistani food. 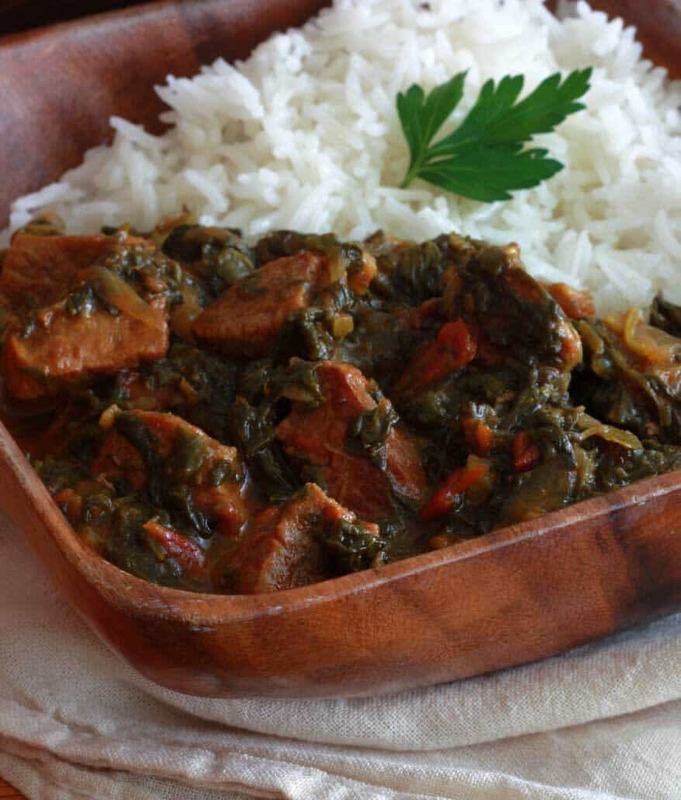 It also made me do some research since we have this really popular dish called Sarson ka Saag here which is not spinach. 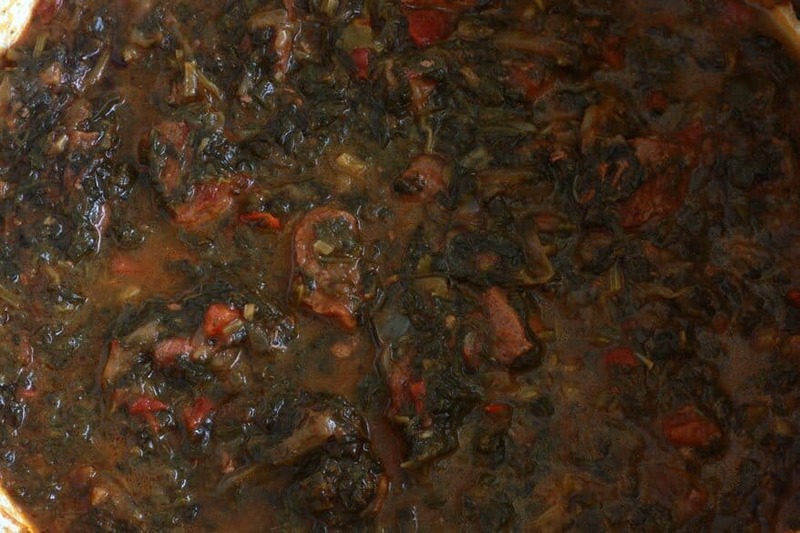 On the other hand we have Palak Gosht and that is meat with spinach (Palak = Spinach). Turns out saag is a generic term for all green leafy vegetables (spinach, mustard greens, etc) and sarsoon is mustard and then it makes sense :). One more thing that I was noting was your use of the dutch oven. Almost all my relatives/friends abroad have taken local pots & pans abroad – the ones available in the US/UK are just not conducive to the amount of browning that we do on a regular basis. But I don’t think it occurred to anyone to try a dutch oven which has a heavier base. P.s. I wanted to ask what the inspiration behind all the Indian/Pakistani recipes were? :) I know the cuisine itself is quite popular, but you pick out recipes that are locally popular but not mainstream. When I saw the Saag Gosht notification in my inbox, I literally clicked at once to read the post :). Interesting Speaking from a white UK middle class perspective, I’ve been cooking ethnically diverse curries for 40 y since house sharing with second generation Asians at uni who would bring their mums curries back from home when it was their turn to cook followed by the recipes. Most households have cast iron enamelled casseroles by a well known French maker for this style of cooking so much so their name is used generically. Though other makers are available as the disclaimer runs. Indeed the big supermarkets regularly run offers of pans at quarter of the price of the originals. An interesting development to watch for are recipes of the stunning foods of the uk Michelin starred level Asian chefs Achul Kochar , Vivek Singh Cyrus Todiwalla Tony Singh to name a few. I love enameled cast iron cookware and use it regularly. It sounds like you’ve had some wonderful exposure to a wide range of recipes over the years – that’s fabulous! The chefs you mentioned are relatively unknown here in the U.S. but I know they’ve published some cookbooks that are available here. Have you tried some of their recipes? Recipes tried where do I start? Made me think hard and put in context what I use. I always remember Rick Stein quoting a survey that most people only cook 2 recipes from cook books they get. Indian Cookery [ a Penguin Handbook ] Dharamjit Singh 1970. All British curry foodies of my generation would acknowledge Madhur Jaffrey who championed cooking indian food at home from the 70s onward (the Delia Smith /joy of cooking equivalent for curry) SO many books but “Illustrated Indian Cookery” has many of my go to recipes. Atul Kochar has many recipes on the BBC Website are these accessible from the states? My visit to Vivek Singh’s Cinnamon Kitchen restaurant in London was amazing . The bill was commensurate and par for the course for this end of the market. Ah, this is wonderful! Thank you so much for taking the time to compile this list! Yes, I’m most definitely familiar with Jaffrey and have heard of Singh. And I just checked – the BBC recipes of Atul Kochar are readily accessible online here. I will look through each of the resources you’ve provided and am looking forward to doing so. Thanks again, Puss N. Boots! Oh – that’s really good to know! Most of my personal experience is of the US because I visit every few years, and so have seen the lack of stuff there. For the UK, its mostly hearsay from friends, who have recently moved there and are probably settling in. Also, in a new country, its always difficult to get the same taste from back home, and so you miss the pots & the ingredients! I haven’t heard of these names either, but will get an eye out for books by them – we do have a lot of British books available at old book stores. Hi Kiran! It’s always so nice to have you come visit :) Yes, I’ve also known a lot of people who have brought their own cookware with them. Probably the biggest complaint that I’m aware of, for Asian cuisine, is the lack of HEAT. Trying to cook with a wok over a standard Western gas range doesn’t produce enough heat to properly sear the food. Similarly, I would imagine there isn’t an adequate substitute for a tandoor over here either – those get blazing hot! Oh yes – the heat! and waiting for the onions to brown. They brown in 2-3 minutes here, but in the US it takes ages and my mom would always be like, the onions have too much water here. Our relatives abroad would ask us to bring packets of fried onions – we have those available in packets here and you can just sprinkle them in the end. For tandoors, we don’t need one at home. In Pakistan, we have tandoors at pretty much every street corner, so fresh naan or chappati can easily be bought and quite a few areas have specialized shops where you can other types of special bread (sheermal, stuffed paratha’s etc). We even have one at our work cafeteria. However, for home cooking, we make regular roti on a tawa pan. Thanks so much for telling me. It’s really good to know how much you love our culture & culture. Food also just has a way of just bringing people together :). Please do keep sharing the ‘unknown’ recipes – i haven’t had the time to cook up one of your recipes, but I love reading up the history of the dish and getting to know about traditions in other countries! I was just seeing a contestant on Masterchef Australia making Koshari the other day, and I just saw the recipe on your blog, and I now the origins to it thanks to you! Oh – one more thing .. If you get the chance, do check out the latest Sanjeev Kapoor book – How to cook Indian. It has a great collection of recipes, from all parts of India, and its very step by step with spice mixes and all. Yes, I’m somewhat familiar with Sanjeev Kapoor. Thank you for the book recommendation! I’ll take a look at it for sure. Hi Kimberley, your food photos are looking great and they are still making my mouth water. As a Brit I love good Indian food, but it is almost impossible to find in my adopted home in provincial Thailand. 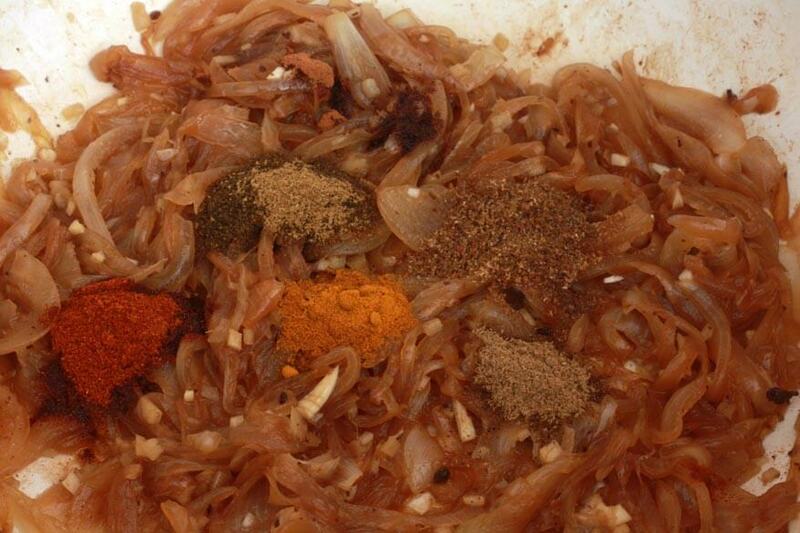 Thais say that Indian food smells and they won’t try it, but they would probably enjoy it if they tried some. It’s also hypocritical because some Thai food smells really pungent. This recipe looks do-able, even though I am the world’s worst cook, and even though a few of the ingredients may be a little tricky to source locally. I really enjoy eating naan bread with Indian food. Do you have a simple recipe for naan? My wife is the baker in our house and made bagels for the first time yesterday. They were excellent. Bagels are another item that are difficult to get hold of, but now that we can make them at home it isn’t a problem. With having such difficulty buying any type of food that isn’t Thai, it really makes a difference being able to make things at home that we can’t buy. Thanks Kimberley – I’ll check back later for your naan recipe and then get my wife on the case! I love many kinds of curry and this one with beef looks just divine. I love seeing all the components come together. What a great dinner with a nice, big bowl of rice! Thanks so much, Monica, and thanks for visiting! We really enjoyed this dish – definitely one to make again and again. Never seen any indian beef dish before, tempting to give this recipe a try! Hello, Dedy, thanks for visiting! Somehow your comment ended up in my spam folder and I only just now noticed it – I’m glad I did! The use of beef in India varies from region to region and the biggest factor is religion. Hindus don’t eat beef, but not all Indians are Hindu. From what I’ve heard it can be a little challenging to find beef in some restaurants in India, but it’s commonly eaten at home among many non-Hindu Indians. Yes, this recipe is a definite must! This was delicious! Thank you. Even though it took about 2 hours, it was easy! Thank you, Chi, for making it and for your feedback! Definitely, the long cooking time is what makes is soooo delicious! All the flavors are able to come together and the meat is so tender! Hi there! 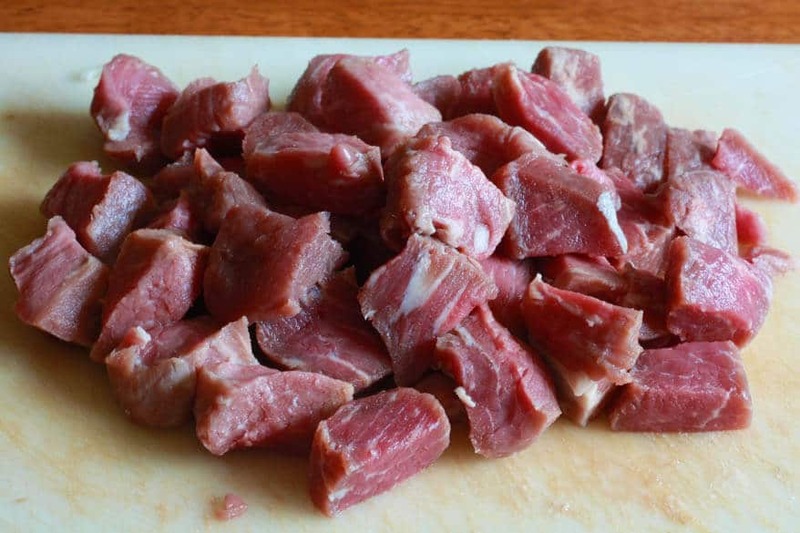 Since I’m living part-time in Kenya (and trying to improve my English skills), I was looking for several recipes which can be realized with the ingredients sold here. Recently, I discovered the Indian cuisine for myself, because of the many available spices such as fresh coriander, ginger, cheap cumin, tumeric, fenugreek etc and the good quality of meat and fish. After several weeks of trying to make such a moth-watering curry you would get in a good Indian restaurant, I finally got it! Asante sana, danke, thank you for this excellent recipe! It tastes excellent. However, next time I will take mutton meat instead of beef… Greetings, L.
I had to check out more of your recipes since I found your blog. This one looks great too. Now, I need to time to try your recipes. Thanks so much, Peter! I hope you will! 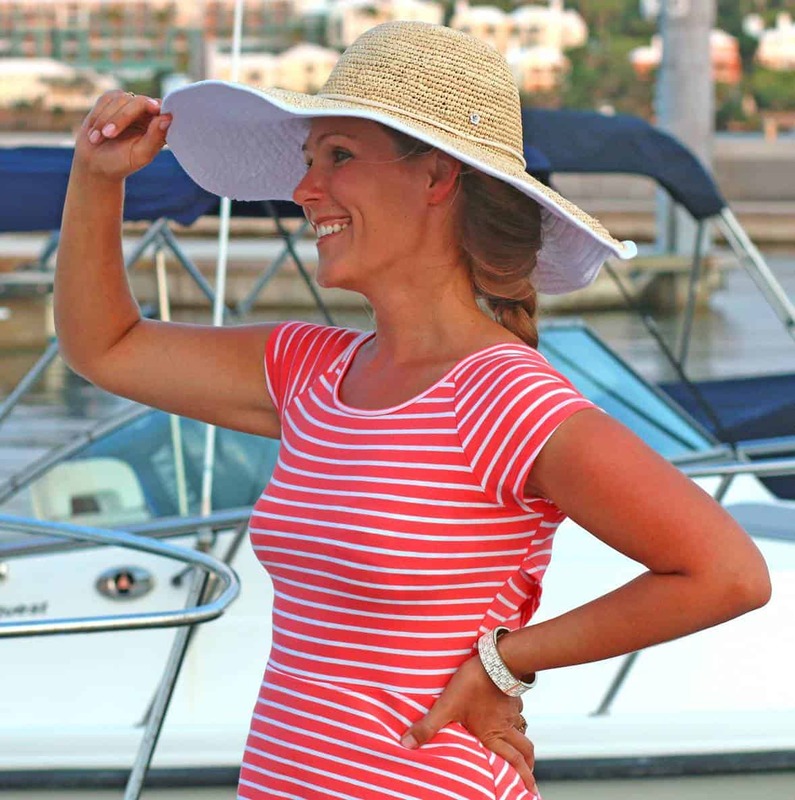 I’m happy you stumbled upon my blog – welcome! I just got some dried dundicut peppers as a stocking stuffer. 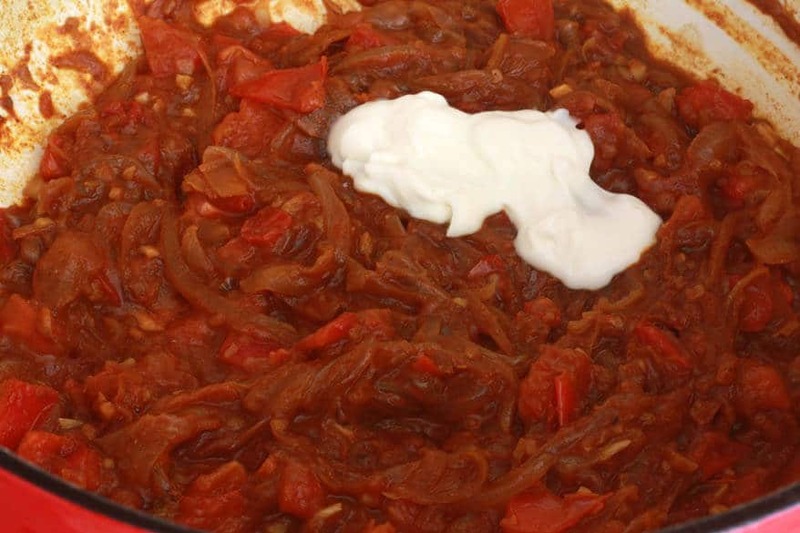 In my search for a Pakistani recipe to try them in I stumbled across this and made it, tossing in a few of the peppers for heat. It was great. Thanks for posting. What a nifty and imaginative stocking stuffer – love it! Thanks so much for making this recipe and for your feedback! Wow – dundicut peppers being used as a stocking stuffer! Never realized they were that unique. We have a bottle of these peppers freshly ground at home all the time – i use them in almost all my western/continental cooking because they give that spicy kick without making it taste ‘Desi’. Could fresh spinach leaves be used to substitute the frozen spinach? Hi Kelly! Yes, you can use fresh, just make sure to blanch it first so the Saag isn’t too runny (boil for just a minute, thoroughly drain, squeeze and chop). Enjoy! Made it on fresh kale instead of spinach. Still tasty. I would normally add some cayenne or similar to give it some heat, but kept to the recipe for the first cook. Thanks for posting. You’re welcome, Chris, and thanks for your feedback! 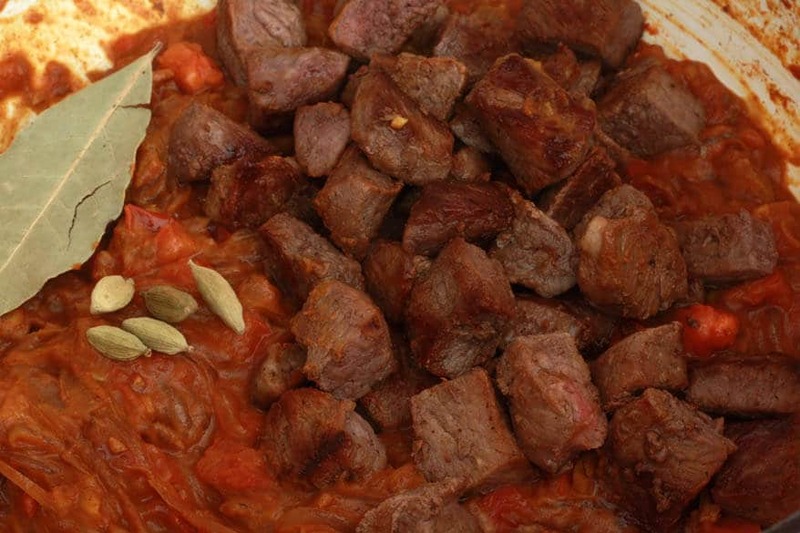 Made this tonight with lamb and it was a winner! It did take a bit of time but was worth it. It was running just a little watery so 1.5 cups of stock should be sufficient. Hi JM, thanks so much for the feedback and I’m thrilled to hear it was a hit! I tried your recipe following the instructions and measurements as listed. This recipe is absolutely fantastic. Your recipe is very easy for me to follow through to the end-precisely. I have the perfect amount left over to take for lunch during the week, and i am grateful-absolutely delicious! Jennifer, I’m so thrilled to hear that and really appreciate your feedback, thanks so much! I wonder how this recipe would translate to a pressure cooker or Instant Pot? I used my instaspot as a crock pot. 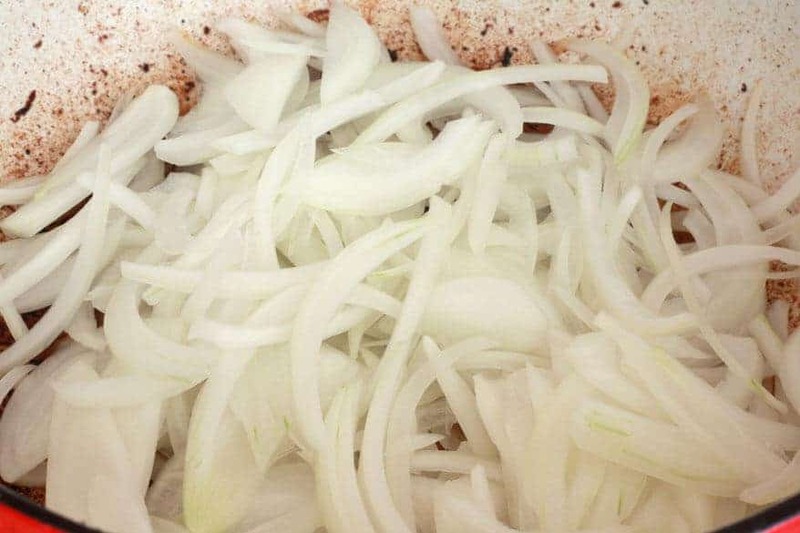 With the sauté setting I was able to brown the meat and carmalize the onions as the recipe calls for. It was perfect!! Thank you for this. It was easy to follow and the taste was great! Can’t wait to try more. I’m so glad you liked it, Danica, thank you! Too much stock and not enough spinach. Otherwise the flavors are very good. This was absolutely delicious, I cut the yogurt and substituted fresh spinach and coriander instead of frozen and ground and it was one of the tastiest curries I have made. Wonderful, Abbie, I’m so glad you enjoyed it, thank you!